“Deceit, Double Crosses, Secret Agendas” — Bring It On! Murder In Common says BLEAK HARBOR is “A labyrinthine journey of deceit, double crosses, and secret agendas.” I’d say that’s a pretty good plot summary. You can read more here. It took me 39 years as a professional journalist to get a mention of Bullwinkle into a story. Now I can retire. Now this is just cool. Thanks to Mark Sadler and Suspense Magazine. Full review coming after it posts on the mag site. 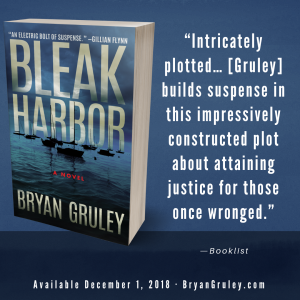 I appreciate this review in particular because it says BLEAK HARBOR is a tale about seeking justice for the wronged. I did not set out to pursue that theme, but the story worked out that way. 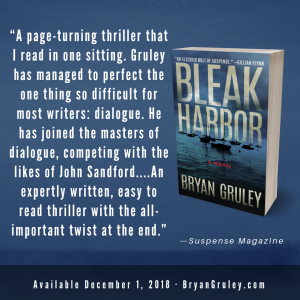 I’ll be talking with the amazing Michael Connelly about his new book, DARK SACRED NIGHT, and my new book, BLEAK HARBOR, on December 5 at the Double Tree Resort in Scottsdale, Ariz. Sponsored by the equally amazing Poisoned Pen bookstore. Details here.